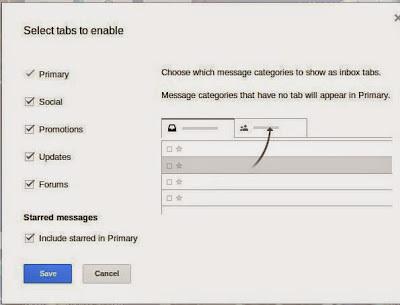 The new Gmail brings Tabs to your inbox. That means, your inbox gets automatically sorted in different kind of mails. If your account is ready to switch you will find the option "Configure Inbox" by clicking the "Gear icon" on the top right side of Gmail. You can activate or deactivate a tab if you don't see a need for it. Social - Mails from social networks like Facebook notifications and Twitter mails e.g. The system works quite well. You still can use your filters as you wish. If you set the filters to "skip inbox" it won't even get categorized before processed. Don't mistake these tabs with labels btw. They're not. You can teach these tabs my moving a message from one tab to another. But no other options are available. It's supposed to make your mail easier, not more complicated. The rest of the design doesn't change. It's not a complete overhaul like some sites said. Just the tabs and the sorting under the hood. If you think it isn't for you after trying, you can deactivate this feature completely and switch back to the old inbox scheme. The mobile apps for Android and iOS will get updates in short time to get use of the new tab features. For me personally it is a amazing time saver. Even I configured my inbox with labels and filters very well, setting a filter for every new service I registered isn't fun. And the overview is much better now, with or without filters. I deleted almost all of my filters to instantly found the mails sorted in their right place. Normally you can expect to "train" the algorithm a bit first. So if you think some mails are categorized wrong, change it once and then it will learn quickly.